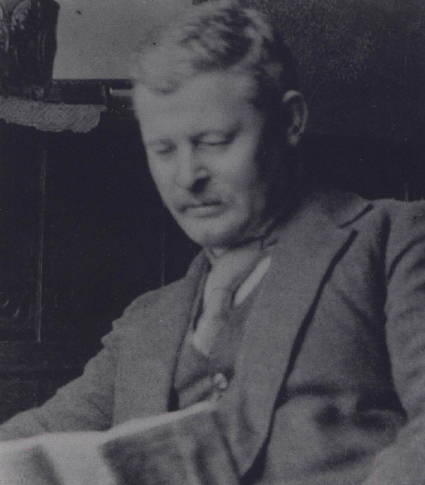 James William Young was born in Redditch in 1870. His father William Young joined the firm of Samuel Allcock in 1874 as a tin maker. In addition to making boxes and cans he also made the tin lining for packing cases. Three months after his arrival he was the company’s principle reel maker. However because of his tinsmith duties he would often come into work at three o’clock in the morning to make the various tins, boxes and other items required of him before starting on the reels. It is thought that the foreman of the various departments were not employees but self employed. The Owner would pay the Forman who would in turn pay his workers. At this time in the history of Allcock, reel making was in its infancy. Slater was still making wooden coaches and Hardy’s were just starting out to make white goods, reels were a long way off in the future for them. Allcock made their first brass reel in 1873, the year before William joined them. At this time only patent lodged with the Patent Office for a reel was by Rueben Heaton. The great leap forward in reel innovation was yet to happen. It was obvious that his father would influence James William Young. At the age of sixteen he had built the world’s smallest full working model of a penny-farthing bicycle. The bicycle consisted of more than 400 hand made parts. Considering the technology of tool making at the time it was a wonderful piece of engineering and a fine achievement. It is generally assumed that James joined his father at Allcock and eventually took over his role as Forman of works. I have been unable to confirm or deny this, what is certain is that Samuel Allcock and James Young would have a working relationship that would last for many years. 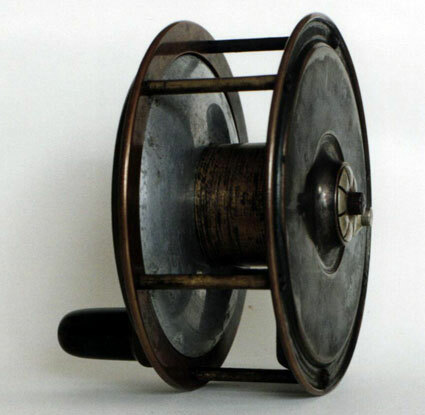 In 1893 James Young applied for a patent for a reel that could be quickly changed from an “ordinary one to a casting one” This reel was featured in the first issue of the Antique Tackle Observer and was sold as The Duplex Reel. Allcock launched the reel in June 1894 in a variety of sizes for salmon fishing. The reel could be set into free spool mode by turning the handle collet. By reversing this movement it could be turned back into an ordinary check reel. The pictures show the handle and collet, made of horn and milled brass. The drum core is brass with the front and back plates made of Aluminium. The rear view of the reel shows the check on off button in nickel silver and the screw pivot-housing bush also in nickel silver. The rest of the reel is made of brass and has a passing resemblance to an all brass Birmingham reel. At the time of getting his first patent granted James was living at the Lamb and Flag Hotel in Redditch. He describes himself as a fishing reel maker. Had his father retired to be the Landlord? I do not know and if anyone does please let me know. In 1895 James was back at the patent office with Alfred Williams, son in law of Samuel Allcock. The patent was for improvements into reels known as “metal back Nottingham patterns” The first was to construct the metal back in the form of a hollow disc to hold the spindle and check mechanism. The second was to make the line guard in such a manner that it could, with a little pressure applied act as a drum brake. The patent was first lodged in January 1895 and finally completed in September of the same year and accepted in October. What I can tell you is that in between the time of the granting of the provisional patent and the final acceptance James had moved to Oakley Road in Redditch. The reel had undergone a few minor changes as well. In the provisional patent the method of releasing the drum had changed from “a half turn with a small nut” “with eccentric motion” to the familiar spring release latch as seen on so many reels. In October 1895 the reel was launched as “The Standard” and received a glowing review in the Angler. 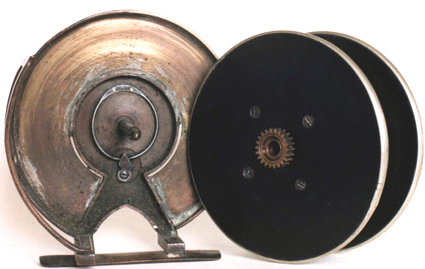 They described this Allcock reel as being made of a brass drum with ebonite sides and “white metal” rims. In the copper back was housed the ordinary optional check mechanism. The line guard made of brass could be flexed and acts as a silent check. The Angler only found one fault with the reel and that was with the handles. They were not sunk into the reel or mounted on plates. The Centrepin of the Simplex Reel. Two weeks later the Fishing Gazette reviewed the reel and this time it was called “The Simplex”. It was available from sizes 3 to 4 ½ inches. 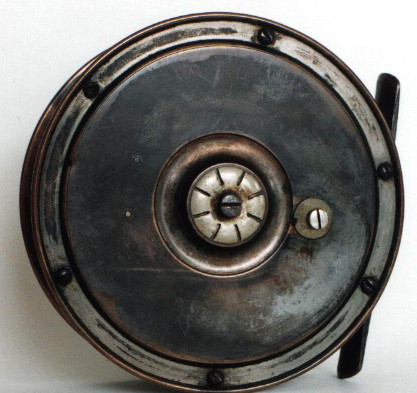 Allcock claimed that it would be an ideal reel for salmon fishing, as only a slight touch on the brake would be needed to stop a running salmon. The Fishing Gazette were not going to let them off so lightly pointing out the fact that the check fitted would not stop a powerful running fish. Another fault they thought was the potential for a snag if the line got between the hollow back plate and the ebonite plate. The Back Plate of the Duplex Reel. Allcock replied that they could fit any strength of check and that the ebonite back plate could have a groove turned in it so as to allow the rim of the back plate is recessed. The reel shown in the pictures has had a full back plate fitted at some time in it’s past. Was this to overcome the potential problem pointed out by the Fishing Gazette? This reel was not a great success; it was undoubtedly a very light reel at the time but it was also a very fragile reel. I have only seen three examples of the reel the one shown in the pictures and two as per the patent. In 1896 Allcock launched the famous Coxon Aerial and some people have credited Young with it’s invention. I do not think so. He was already familiar with the patent laws having gone through the process twice. Why would he let Allcock take out the patent on his own? He was undoubtedly involved in the manufacture of the reel. The skills needed to work the brittle and fragile ebonite were already in place. I know of a few Coxon’s that have the Young’s name stamped on the ebonite. In 1905 he was back at the patent office with an improved breaking device. He points out in his complete specification that this is not a locking apparatus for the Aerial reel but is an additional part. In Jamie Maxstone Graham’s book on patents he says that no sealing fee was paid and therefore no patent granted. This is a mistake as it was granted on 30th November 1905. We can also tell that he was now a Fishing Reel Manufacturer at 27 Oswald Street in Redditch. Another point emphasised is the fact that a patent ran for 16 years. So after 1921 it would not have been stamped on the front flange of the drum. I have seen some various people put some wonderful dates on Aerial reels with adjustable brakes and the word PATENT stamped on the drum. These range from 1896 to 1930. Although J. W. Young’s were essentially as reel maker they did take out a patent for an improved lock joint for fishing rods that could also be used in securing handles to tools. This was in April 1910. By the time that this patent had been granted James had moved to 171 Mount Pleasant in Redditch and was obviously prospering. 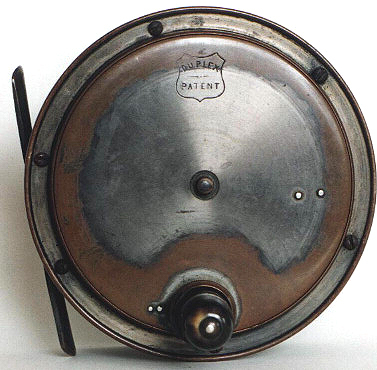 In 1911 S. Allcock & Co. together with James Young proceeded to invent a locking drum and combined brake mechanism for centrepin reels. This was a full six years after the introduction of the brake for the Aerial. 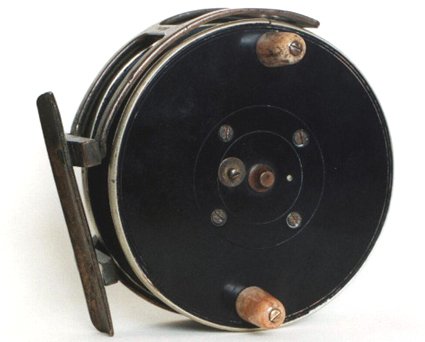 This reel was called the Britannia and like the Coxon Aerial was available with a wood back and solid ebonite drum. Other models were available with an aluminium back plate. One year later another patent was granted No 22420 and I must admit that this one has caused me some problems. It looks as if he was trying to improve the brake mechanism by using a lever and at the same time provide a facility to wind in any slack line. 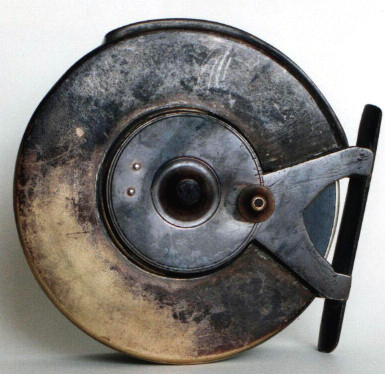 The drum is similar to the Aerial drum but I have never seen this reel. Does anyone have one? In 1919 another patent was granted for an adjustable lever brake and for a second emergency brake. Has anyone got one? There might have been other developments with the Aerial reel but in 1921 whilst on holiday in the Isle of Man James William Young died. It has never been established as to exactly what happened but the facts are these. James had gone to Douglas with one of his sons but there was a mix up with the accommodation. There was no room so James went to the Carlton House where he was given a temporary bed in the drawing room on the second floor. His son went to the Lion House further along the sea front. The next morning Mr. Young was not in his bed, the window was partially opened and it was assumed that he had gone out for a walk. Some time later a Mr. Bernard Avoy found the body of James Young in a pool of blood in the basement with a severe wound to the head. A doctor was called who pronounced him dead. There was a small ledge just in front of the window in the drawing room. It was assumed that not being familiar with the layout of the room he tripped and fell the twenty-two feet to his death in the basement. The Douglas coroner’s jury returned a verdict of Accidental Death. Two Redditch manufacturers, a Mr. Lewis and Mr. Heath, were staying at the same house and were able to help James’s son. The body was returned to Redditch where he was buried. Two sons Howard and James Robert worked for the company and carried on the business. Another son Edward E. Young joined the company in 1940. The company continued to take out patents and make reels as J. W. Young & Sons. This entry was posted in J. W. Young. Bookmark the permalink. William Henry James Young at Lamb and Flag 31/35 Unicorn Hill Redditch licensee 1894-99 from Old Redditch Pubs by Alan Foxall. Hope this is of help.